Will You See Mars and Mercury? Is Jupiter's Missing Stripe Returning? Mars and Mercury are difficult to see in the twilight night sky. They hug the southwestern horizon, so you'll need right timing, clear skies, a flat, unobstructed view, aided vision, experience and good luck!!! 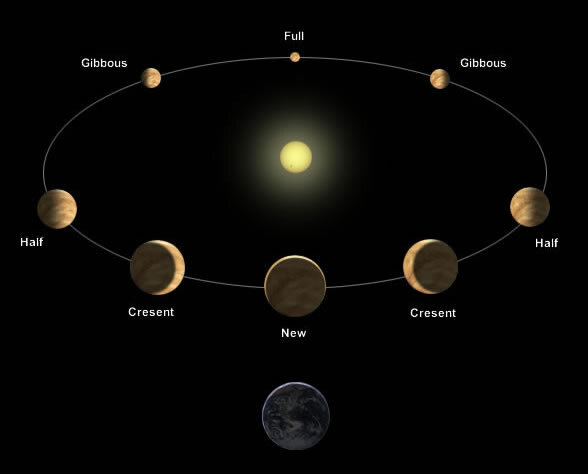 Mars sets about an hour after the Sun, at 7:30pm Daylight Time in the beginning of Scorpio and at 6:00pm Standard Time by its end. Mercury sets less than an hour after the Sun during Scorpio. Bring along binoculars for your sunset observations, the stronger the better! November 7, Sunday, the whisker thin young Moon, Mars and Antares are in close proximity, while Mercury hugs the horizon. You just may see young Luna who can guide you to Mars and Antares, however it may be impossible to see the star and planets. Click 11/7 Dusk Map/Text to learn more. Also see this 11/7-8 twilight map. Mars and Mercury transit the cosmic Scorpion November 7-21. December 1, Wednesday, Mercury is at greatest elongation, east of the Sun (21º). You can see the phases of Venus in the image above. The planet moves from her Full phase (image top) to her waning Gibbous and waning Crescent phase in the evening sky (image left). As the planet switches from the evening to the morning sky, it is positioned between the Earth and Sun in what is called inferior conjunction, hidden from our view by the bright light of the Sun (image bottom). This marks Venus in her New Phase, similar to a New Moon. Venus is in inferior conjunction October 28. A few weeks before and after inferior conjunction, Venus appears to move backwards among the stars, to the west instead of to the east. This westerly motion is called a retrograde. Venus is retrograde October 8 - November 11. During the retrograde Venus is at a close approach to Earth and briefly beams her striking, bright light very close to the horizon, piercing the twilight glow in the evening and then the morning sky. Venus moves from her New phase (image bottom) to her waxing Crescent and waxing Gibbous phase in the morning sky (image right). Note: In the evening sky (image left) Venus gets bigger in disk size and her illuminated phase decreases; in the morning sky (image right) the opposite occurs. You can also see this demonstrated in APOD's animation of the phases of Venus. During Scorpio, morning Venus waxes to a 15% illuminated Crescent. Shows Venus approaching inferior conjunction in 2004. As the image above shows, the orbital motion of Venus creates a difference in apparent disk size and phase illumination. This results in a unique and surprising greater or lesser brilliance. Venus, less illuminated by the Sun, appears more brilliant! When Venus is far from Earth, it lies on the far side of the Sun (image top) and we telescopically see Venus fully illuminated by the Sun. A "Full Venus" is like a Full Moon. Venus moves from a Full phase toward a thin Crescent phase, as it nears Earth and inferior conjunction (image bottom). A thin Crescent Venus closer to Earth looks bigger and, therefore, brighter than a small "Full" Venus farther away from Earth. Hmmm ... Evening Venus (image left) was at greatest brilliancy, magnitude -4.8, September 23, when it was a 26% waning Crescent. Morning Venus (image right) achieves greatest brilliancy December 4 at magnitude -4.9, when it is a 26% waxing Crescent. This retrograde cycle is integral to a larger 9 month cycle that encompasses 3 exact conjunctions of Venus and Mars: August 20/21 + October 3, 2010 and May 22, 2011. Saturn rises in the in the morning sky accompanied by brighter golden Arcturus to the north. Review maps above. 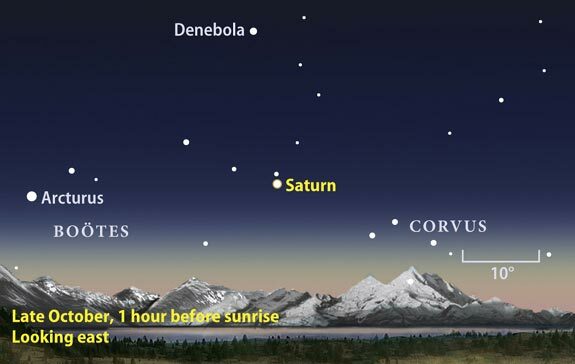 At the end of October, an hour before sunrise, look low in the east to find the pair. November 3-4 use the waning Crescent Moon to locate Saturn. 11/3-4 Dawn Map As the days unfold, both Saturn and Arcturus climb higher before dawn. By mid-November the ringed planet is almost 1/3 of the way to the zenith. Saturn rises in the beginning of Scorpio at 5:30am Daylight Time and at 3:15am Standard Time by its end. As seen in the map above, Spica and Venus lie below the ringed planet in mid-November. Saturn at magnitude 0.9 shines a little brighter than Spica at magnitude 1.0. Venus blazes at magnitude -4.4, so bright it may be mistaken for a UFO! Note: Venus rises up to Spica during Scorpio; the closest they get is 4 degrees during the third week of November. Saturn's telescopic rings are tilting open, revealing more and more of their northern face. The planet's ring tilt is 9º in November. Saturn's Rings 11/15 Generate images of Saturn's ring tilt as seen from Earth with the Solar System Simulator. Is the Planet's Missing Stripe Returning? Note: Earth's size is seen in the lower left of the image. Eleven Earths can fit across Jupiter's diameter! Have fun checking out the Interactive Planet Size Comparison. Choose miles or kilometers for the unit of measurement. 11/11/10 Update: Jupiter's missing stripe may be returning! Experienced planetary photographers are encouraged to monitor Jupiter for further developments. Stay tuned to spaceweather.com for the latest updates. In the Hubble view [above], a slightly higher altitude layer of white ammonia ice crystal clouds appears to obscure the deeper, darker belt clouds. "Weather forecast for Jupiter's South Equatorial Belt: cloudy with a chance of ammonia," Hammel says. "The Hubble images tell us these spots are holes resulting from localized downdrafts taking place. We often see these types of holes when a change is about to occur," Simon-Miller says. Amateur astronomers are reporting a surprising number of fireballs exploding in Jupiter’s atmosphere! See Fireballs Light Up Jupiter to learn more. The Hubble News Release 6/16/10 for the above image also explains why some Jupiter impacts do not leave a debris cloud. Jupiter catches the eye as it travels high above the southern horizon during the evening and early morning hours. The brilliant planet is easily seen in the southeast about 30 minutes after sunset. By 8:00pm it shines at its highest in the south. Early birds and night owls can watch Jupiter sink in the west and set around 4:15am Daylight Time in the beginning of Scorpio and at 1:45am Standard Time by its end. Jupiter, moving further from the Earth, dims during Scorpio from magnitude -2.8 to magnitude -2.6 and its disk size shrinks about 10%. Though diminishing in brightness and size the planet remains the brightest point of light in the night sky until it sets. During Scorpio, Jupiter's retrograde motion (7/23-11/17) increases the giant planet's distance from nearby Uranus. Uranus retrograde (7/5-12/4) shines at magnitude 5.8; the normally telescopic planet is now bright enough to be seen with binoculars and without an optical aid in a dark sky. November 15/16, Monday/Tuesday night, Uranus, Jupiter and the waxing Gibbous Moon are in close proximity, in the Celestial Sea at the circlet of Pisces. 11/15 9pm Map Click Moon Dances for an 11/ 13-18 star map and meditative reflections. Learn more about the Celestial Sea below. Viewing Jupiter with a telescope promises to be an adventure. Any size telescope will reveal Jupiter's missing South Equatorial Belt or perhaps the "SEB Revival" ... the return of the missing stripe! In addition seeing nearby Uranus with a telescope or binoculars is a special 2-for-one planetary treat! Both planets, still relatively close to Earth, also lend themselves to better than normal observations. Do you see the witch's face? and her pointed nose is just above center. Reach for Heaven's Light, if you ever have a fright! Note: "Because Halloween greeting cards often depict a witch riding a broom in front of a full Moon many people have the mistaken notion that there is a full Moon every year on Halloween when in fact we won't have a full Moon on Halloween again until 2020. In fact this year the Moon won't rise until almost three in the morning and it will be a waning crescent Moon." Star Gazer 2010 Script 10/18-24 Click Moon Dances for a map and meditative reflections on the Hallow Moon. The above map shows the Celestial Sea constellations as seen from mid-northern latitudes around 10:00pm Daylight Time in October and 9:00pm Standard time in November. Eridanus is mostly below the horizon. The constellations move up in the sky during the night, so most of Eridanus becomes visible low on the horizon by midnight. Celestial Sea sailing requires both skill and experience, also the darker the sky the better for navigating among these faint constellations. During the mid-to-late evening hours ... there are very few bright stars in the region that is spread across the southern skies. In 2010 Jupiter is the brightest point of light residing in the Celestial Sea. Mira, a variable star in the constellation Cetus, changes in brightness during the year, making it visible or invisible to the unaided eye. Mira, reaching maximum visibility in early October, can now be viewed without an optical aid. Look for this variable star east (left) of Jupiter, when there is no moonlight interference. Use this printable map as a guide; it also shows the location of the Moon 11/13-18. Note: Be sure to look for the shapeshifting Celestial Sea triangle November 13-18. The stars overhead change as the seasons change on Earth. The stars highest above the horizon in mid-evening are considered to be the stars of the season. In the beginning of November go outside 8:00pm-9:00pm. The three brilliant stars of the Summer Triangle are beginning to slowly descend toward the horizon. Almost overhead are the four much dimmer stars, which make up the Great Square of Pegasus the winged horse, the Autumn Square. The Autumn Dipper? A Flying Horse? Time Traveling? Navigate with Pegasus and Cassiopeia. Locate Andromeda. we become the night sky travelers! Mars and Mercury hug the southwestern horizon and are challenging to see in the twilit sky. You'll need right timing, clear skies, a flat horizon, aided vision and good luck!!! 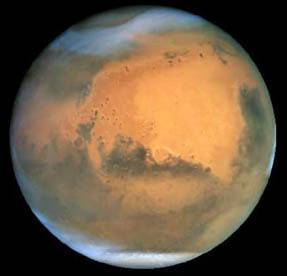 Mars sets about an hour after the Sun, at 7:30pm Daylight Time in the beginning of Scorpio and at 6:00pm Standard Time by its end. 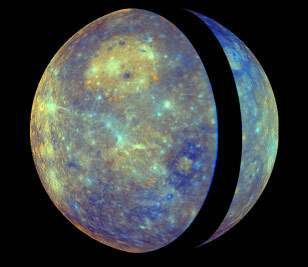 Mercury sets less than an hour after the Sun during Scorpio. 11/7 the youngest, thinnest Moon, Mars and Antares are in close proximity; will you see them? 11/7 Dusk Map/Text If you're up for another challenge, Mars and Mercury are at their closest 11/20 in the deepening twilight. Mercury is 5x brighter than Mars. 11/20 Map Bring along binoculars for these observations, the stronger the better! Venus retrograde (10/8-11/17) is in inferior conjunction 10/28. A few weeks before and after this conjunction Venus is at a close approach to Earth and briefly beams its striking, bright light very close to the horizon, piercing the twilit glow. Inferior conjunction marks Venus' switch from the evening sky and the sunset horizon to the morning sky and the sunrise horizon. 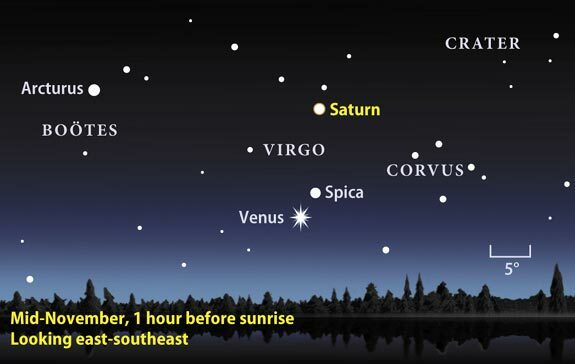 Begin looking for morning Venus 11/7, around 5:45am, in the east-southeast; Spica and Saturn lie above. Mid-November Map Evening Venus was at greatest brilliancy, magnitude -4.8, 9/23; morning Venus achieves greatest brilliancy 12/4 at magnitude -4.9. Venus has phases like the Moon. Before inferior conjunction, in the evening sky, Venus gets bigger in disk size and its illuminated phase decreases; afterwards the opposite occurs in the morning sky. You can see this demonstrated in APOD's animation of the phases of Venus. These phases and more can be seen in this 2010 Evening Animation of Venus. Also check out this montage, which shows Venus approaching inferior conjunction in 2004. During Scorpio, morning Venus waxes to a 15% illuminated Crescent. 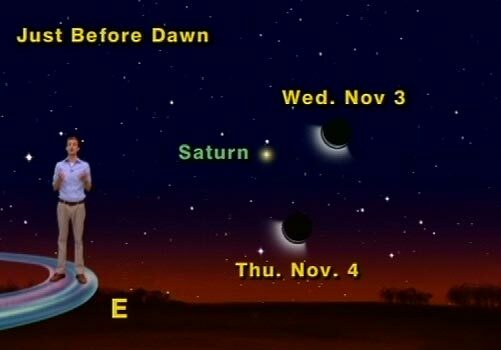 Saturn appears in the morning sky, low in the east at the end of October. Look about an hour before sunrise. Brighter Arcturus lies to the north (left) of Saturn Late October Map 11/3-4 look for Saturn and the waning Crescent Moon. 11/3-4 Dawn Map As the days unfold, watch Saturn climb higher before dawn. By mid-November Saturn is almost 1/3 of the way to the zenith. Spica and Venus lie below the ringed planet at this time and Arcturus lies to the north. Mid-November Map The planet shines at magnitude 0.9, brighter than Spica at magnitude 1.0. Saturn rises at 5:30am Daylight Time in the beginning of Scorpio and at 3:15am Standard Time by its end. Saturn's telescopic rings are tilting open, revealing more and more of their northern face. The planet's ring tilt is 9º in November. Saturn's Rings 11/15 Generate images of Saturn's ring tilt as seen from Earth with the Solar System Simulator. Vega is the brightest star in the northwest, setting in the beginning of Scorpio at 2:00am Daylight Time and by its end at 11:30pm Standard Time. It is the western point of the Summer Triangle, which is slowly sinking on the western horizon giving way to the autumn stars overhead. Altair is the triangle's southern point and Deneb the eastern point. Fomalhaut is the brightest star low on the southwestern horizon, setting in the beginning of Scorpio at 2:00am Daylight Time and by its end at 11:30pm Standard Time (same as Vega). 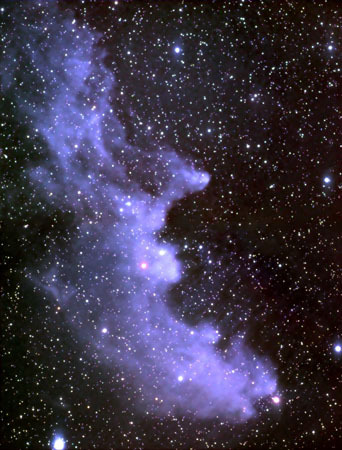 It is the Southern Royal Star and the brightest star in the constellation Pisces Austrinus below Aquarius. In 2010 brilliant Jupiter lies diagonally to the northeast of Fomalhaut Star Chart It is part of the celestial sea constellations. Capella is the bright star in the northeast. Capella is the brightest star seen the most often. The Great Square of Pegasus is a sure sign of autumn. Look for the four stars almost overhead as night begins. Stars of Autumn Also see Autumn Dipper? A Flying Horse?.